The holiday season is quickly upon us, with all the hustle and bustle we associate with this time of year. Many of us who celebrate Thanksgiving will have our first “taste” of this swirl of activity as we pick out recipes, go grocery shopping, travel to visit friends and family, cook elaborate dishes, and serve up veritable feasts for our loved ones. In this midst of all this activity, it would be easy to forget the real reason for the holiday gatherings we put so much work into preparing: to connect with those we love. When we get all the family in the room, some traveling from far away to be together for just an afternoon, it is prime time to catch up on the year that has nearly passed and reminisce about the stories from days gone by. When we assemble the whole crew in the room for a get-together, it is essential to remember those of us who experience hearing loss. These events can be trying times for those who struggle to hear, and some even feel social anxiety at the expectations placed on them to hear, understand, and respond in a noisy environment. Just imagine how difficult this experience could be, with timers going off in the kitchen, the television blaring a sports game, dogs barking, children screaming, and someone you love trying to tell you something important all at the same time. You may feel anxious just at that description! Take this opportunity to consider how you can best assist your family members with hearing loss as these events approach. A few simple tips will help make the day more enjoyable for everyone involved. Helping your loved one with hearing loss get to the event is the first step. Make sure that nobody feels the urge to skip the event due to anxiety at the hearing expectations that will be placed on them at the event. Assure your family member that you will be there to assist with communication and to provide an environment that is conducive to easy communication. You can even drive your loved one there yourself, making the process even easier. If you are hosting a holiday event, take into consideration the needs of your guests with hearing loss. You may want to ask them what accommodations would help them have an easier time. When setting up your home, consider grouping two or three chairs together, to create smaller seating arrangements to facilitate easier conversation. Once you have arrived at the holiday gathering, make hearing as easy as possible. Turning down the volume on the television is the first step, and you may even want to turn it off altogether. See if you can designate a place for children to be loud and rambunctious away from adult conversations. And if there is too much music, conversation, or noise in one area, you may want to find a quiet nook for individual conversations. Speaking clearly and slowly can greatly help those with hearing loss, but you don’t necessarily need to shout. Raising your voice slightly can be helpful, but too much can seem harsh or distorted to someone with hearing loss. Tone is the key, and make sure that at whatever volume you choose to speak that your tone is just the same as it would be with anyone else: comfortable, conversational, and easy. Don’t repeat the same thing over and over if someone struggles to understand. Instead try restating the concept, providing additional context clues for the person to understand. In group conversations you may even want to provide hints to your family member with hearing loss at close range. For instance, if you are sitting side-by-side at a meal, you can fill in your family member with some general details, such as “Oh, isn’t that nice, Josephina just started school.” These moments of translation can make a world of difference. Perhaps the best thing you can do to enjoy conversations during the holidays is to schedule an appointment for a hearing exam at Hearing Group. If a hearing loss is detected, our team will work with you to find the best treatment for your needs. 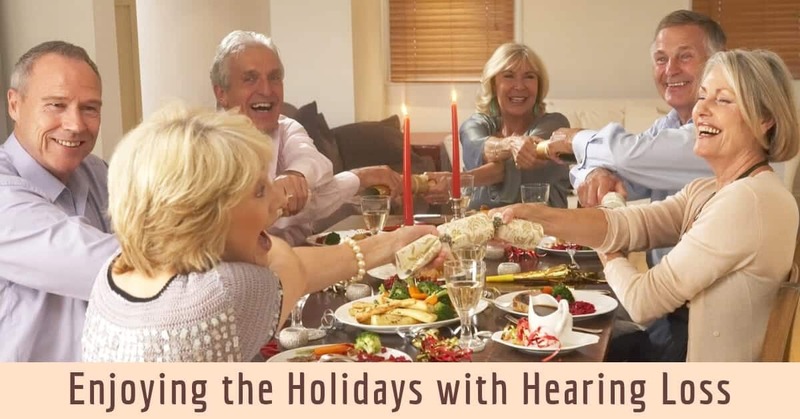 Just imagine holiday gatherings to come, when hearing loss is no longer an issue! Contact us at Hearing Group today to schedule an appointment.